Dayan Qigong forms an integral part of both traditional and modern Chinese medicine and is increasingly being offered as an adjunct to standard Western medical treatments for pain management and a variety of medical issues such as immune system problems, headaches, multiple sclerosis, Parkinson’s, arthritis, fibromyalgia, GI distress. Once learned, benefits can occur from practicing Dayan Qigong as little as 15 minutes a day. For centuries, Dayan Qigong was passed down in secret from master to disciple. After the cultural revolution, however, Grandmaster Yang Meijun decided to teach publicly. One of her foremost disciples is Master Hui Liu of the Wen Wu school, who Bob is fortunate to have as his teacher. Bob introduced qigong classes to Kaiser-Permanente (one of the largest health care providers in the USA) about 15 years ago; these classes have helped hundreds of patients. Bob regularly teaches qigong in Sacramento, California and the Sierra foothills, as well as in annual retreats in Melbourne, Australia; Amsterdam; Finland; and frequent workshops at Kripalu (Western Massachusetts) and Mexico. He has taught qigong to students and faculty at the American College of Traditional Chinese Medicine; to physicians and mental health providers; Zen students; and imprisoned women. He has also taught qigong in India and Nepal. He helps his teacher train other teachers, and has produced instructional videotapes and DVDs for Master Liu. The video above shows Bob doing a condensed version of the first set, with narrative explanation. The video above shows Bob doing the complete first set, without narration. The auditory player to the right contains a 20 minute narration in which I talk you through the 64 movements of the Dayan Qigong First Set form. To help you learn the set, you can download the mp3 file by right-clicking on it, then listen to it and follow along with the instructions. Dayan (Wild Goose) Qigong is a 2000-year old Taoist tradition designed to open up and promote healthy functioning of the acupuncture meridians. Legend has it that Bodhidharma, who brought Zen Buddhism to China, invented qigong to help his monks’ meditation practice. 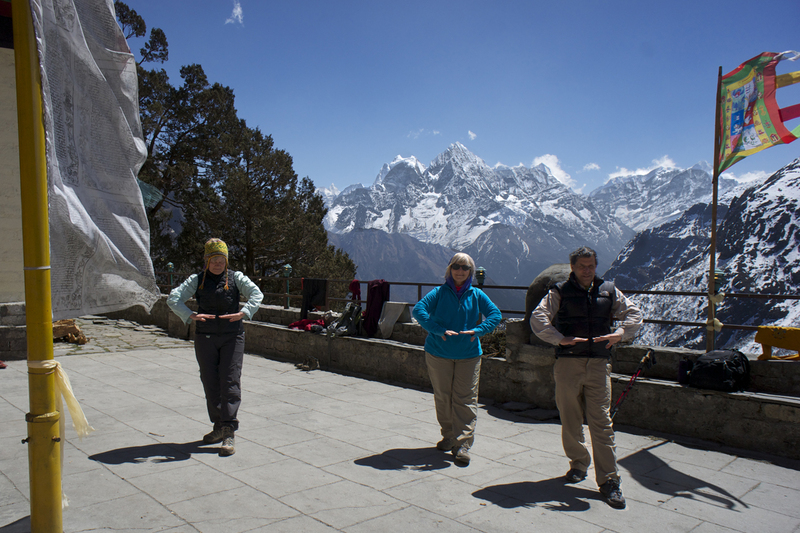 Dayan Qigong includes several sets of 64 movements and also warm-up exercises, acupressure massage, and meditation. Each of the most ancient qigongs imitates some of the movements of an animal venerated for its virtues. 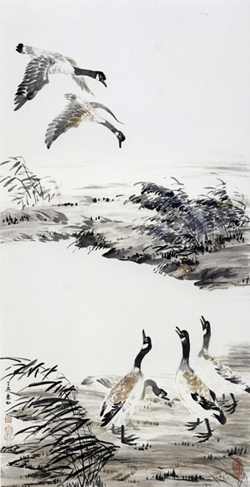 Dayan ("Wild Goose") Qigong includes flying, fluttering movements which help open the acupuncture meridians. Wild geese are loyal to each other; they mate for life. They teach us the value of a wider community: by flying in a flock, they minimize wind resistance, creating uplift for each other. They share responsibilities: when the lead bird tires it rotates back into formation and another goose flies to the point position. They also take care of each other: if a bird gets sick and drops out of formation, two others follow it and stay with it until it dies or is able to fly again.